There are absolutely no refunds or exchanges for non-members. The Ridgefield Playhouse is a 501 (c)3 Non-Profit Organization. If you are a ticket holder unable to attend an event, The Ridgefield Playhouse will accept the tickets back as a tax deductible donation up until the start time of the said ticketed event. Patrons who donate tickets will receive a tax deductible receipt confirming the donation. 2. Tickets must be paid in full at time of purchase and payment will be immediately deposited and processed upon receipt. Cash, Visa, Mastercard, American Express, Discover, personal checks or money orders are welcome. Orders placed in person or mails via CASH or CHECK, are subject to a non-refundable $4 ticket processing fee and $2 facility fee per TICKET. Orders made ONLINE, by phone, in person, or mails via CREDIT CARD, are subject to an additional $3.00 non-refundable credit card processing fee as well as the $4 ticket processing fee and $2 facility fee per TICKET. There will be a $25 service fee for all checks returned for insufficient funds. 3. If your tickets are to be “held at will call”, they will be at the venue box office any time during box office hours, or at least 60 minutes prior to scheduled door time of event. It would be helpful if you can arrive early to allow for parking and to avoid the last minute rush. If you have PRINT-AT-HOME tickets, the tickets must be printed and presented at the door to gain entry. 4. All member and individual ticket orders are filled in order of receipt. Tickets ordered within 10 days of performance will be held at the Box Office. 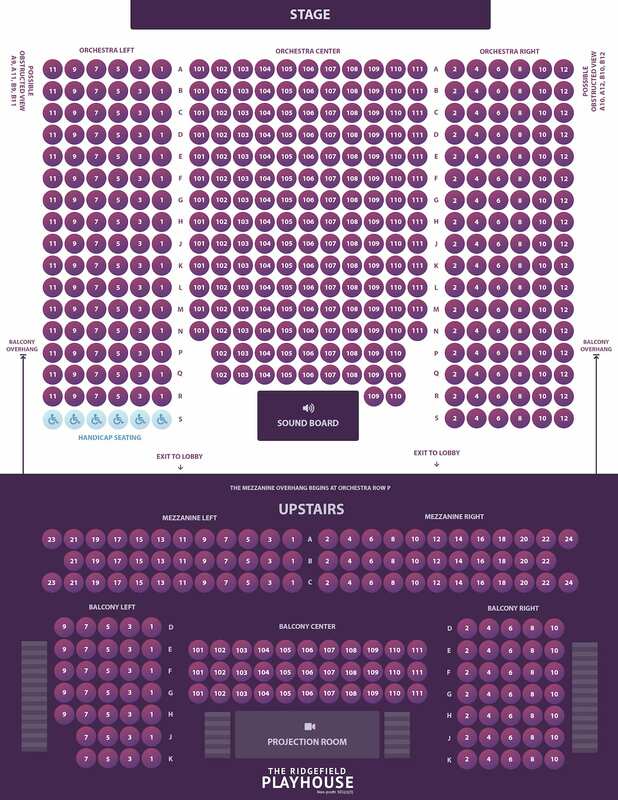 Every effort is made to process orders according to customer request; however, The Ridgefield Playhouse cannot ensure that the choice specified will be available, in which case the Box Office will assign the next best available seating. While every seat is a great seat, ordering early is highly encouraged. Tickets should be examined upon receipt. Lost or misplaced tickets may be reprinted with ID. A $3 fee will be due per reprinted ticket. 5. For the Family shows, a child 12 months and younger may be admitted without a ticket; so long as the child occupies the same seat as a ticket holder. For all other performances, persons without tickets will not be allowed to enter the theatre. 6. The ticket holder voluntarily assumes all risk and danger incidental to the event for which this ticket is issued whether occurring prior to, during or after the same. Venue operators, employees, and/or venue volunteers cannot/will not be held responsible or liable for injuries, loss or damages incurred by patrons while attending these events. 7. Discounts may not be used in any combination or retroactively. Discounts must be requested at the time of purchase. Full-price tickets may not be exchanged later for discounted tickets nor may a refund be given for the difference between the full price and the discounted price of the ticket. Child ticket prices refer to anyone under the age of 12. Student ticket prices refer to anyone under the age of 18 or can provide a student ID at the time of sale. Senior ticket prices refer to anyone over the age of 62. 8. In case of inclement weather, should the performance occur, there are NO refunds or exchanges. Should a performance be CANCELLED, exchanges will be available through the box office. Requests for refunds are on a case by case basis. All shows are subject to change. Should a show be postponed and/or rescheduled, the original tickets will be good for the rescheduled date or reissued. If you are a ticket holder unable to attend a rescheduled date, there are no refunds; however, exchanges will be available through the box office. Requests for refunds will be handled on a case by case basis. If you are in possession of your tickets, they must be returned to the box office before an exchange or refund can be considered. While Ridgefield Playhouse regrets the inconvenience caused by these circumstances, Ridgefield Playhouse cannot be held responsible for any cost or damage such postponement or cancellation may incur. We will also accept the tickets back as a tax deductible donation. 9. Discounts are available for groups of 20 or more. For information and reservations, call our box office at (203) 438-5795. 10. There are absolutely no weapons of any kind allowed on premises. No outside food or drink are permitted. Tickets are a revocable license and may be taken up and admission refused. The resale at a higher price than the original sale price unless specific authority is granted in writing is grounds for seizure and cancellation. Gift Cards are available through the box office in any amount. Parking is available for our patrons on a first come first served basis–arrival one hour prior to curtain time is recommended for the best parking. Parking spots marked off by cones are for priority parking members and will be removed by Playhouse parking attendants or law enforcement only. Parking is limited- please carpool when possible. Access for persons with disabilities is available throughout The Playhouse for audience members and performers. Please call the box office at (203) 438-5795 to specify your needs.